So there's this restaurant in State College called Champs. It's a local sports bar chain, so you might expect your standard bar food and nachos (which you can definitely get), but they also have some reallllly tasty, unique, and fresh options. And they make their own salad dressings. Am I the only person that judges a restaurant on this? I can't be. Anyways, specifically at the downtown State College location, they have this salad called the Broccolini Salad, and it is SO GOOD. It starts with a giant spoonful of hummus smeared directly on the plate, and then a salad is placed right on top of it. It's a green masterpiece, combining different flavors and textures and temperatures... baby kale, arugula, shaved brussels sprouts, sautéed broccolini, avocado. 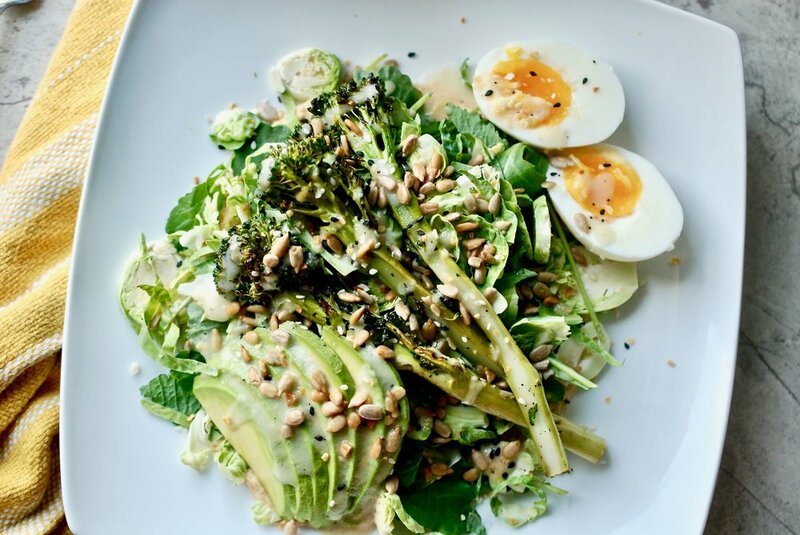 Throw an egg on the side, drizzle it with apple cider vinaigrette, and sprinkle with sesame seeds and sunflower seeds. It is unlike any salad I've ever had. I bet you can guess where I'm going with this... I HAD to recreate it at home. This is a pretty standard knock-off recipe, but I did have to guess on amounts and preparations and added a fun little twist at the end. In case you're wondering what broccolini is; it's baby broccoli! It comes in cute little stems and florets and I found it at Trader Joe's, but if you can't find it, just use good ol' broccoli. I would assume Champs either sautées or roasts their broccoli, but I cooked it on our grill. I made homemade hummus, but until I get my act together and post the recipe for you, just use your favorite recipe (or favorite brand!). You could probably find an Apple Cider Vinaigrette dressing in the store, or a recipe online, but I really loved this salad with my Apple Sauce Vinaigrette (modified slightly by adding the zest and juice of a lemon). Fun twist! Instead of sprinkling the salad with sesame seeds, I highly recommend Trader Joe's Everything But The Bagel Seasoning (EBTB, for those in the know). I made a bunch of these and ate them for lunch all week, but if you can imagine grilled broccolini, kale, and brussels sprouts all sealed in one bowl for a few days, it gets a little stinky in there! If you're weird about smells, store the ingredients separately and throw it all together before you want to eat it! If you DO package them up for a couple of days, go in this order: hummus on the bottom, grilled broccolini, shredded brussels, baby kale, arugula. 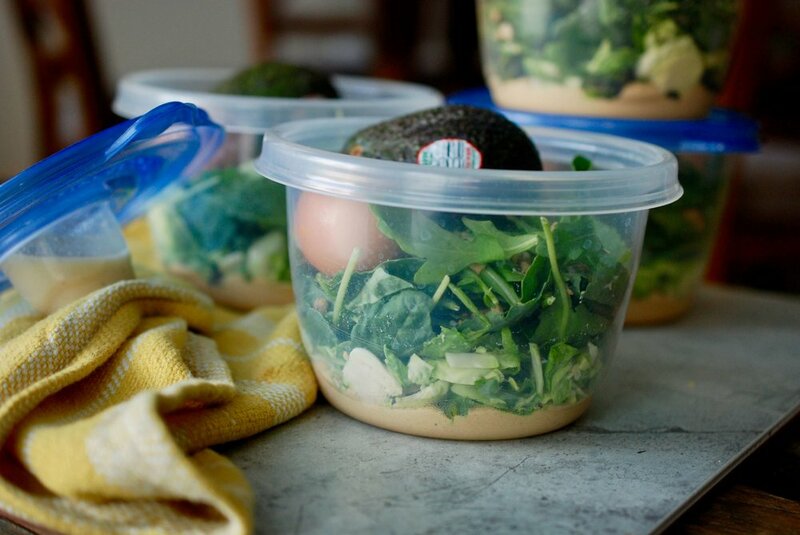 Throw in an unpeeled hard boiled egg, sprinkle with EBTB, and store your avocado and dressing separately. First, grill or roast your broccolini! Toss broccolini with some olive oil, salt, and pepper. Grill over medium heat for 5-10 minutes, or until crisp tender, turning every couple of minutes. I did about 5 min over direct (medium) heat, then 5 more minutes over indirect heat (moved to the little upper grate in the back). OR roast at about 400 degrees Fahrenheit for 10 min or until crisp tender. Spread a healthy layer of hummus right on the plate. Top with a handful of baby kale, a handful of arugula, and a handful of shredded brussels sprouts. Cut hard boiled eggs in half and add to each salad. Slice up avocados and add to each salad. Sprinkle with Everything But The Bagel Seasoning and sunflower seeds. Drizzle with Apple Sauce Vinaigrette. Grilled Broccolini Salad – Maria Makes: Champs Downtown in State College, PA has this amazing salad called the Broccolini Salad, and it is unlike any salad I've ever had, so you know I HAD to recreate it at home. Hummus, shredded brussels, baby kale, broccolini, avocado, EBTB!